This topic contains 147 replies, has 18 voices, and was last updated by Brendan 5 years ago. Hello, my name is internet. Welcome. Sorry for leaving wrong impression. Bitcoins face massive risk if they grow significantly, mostly because govts and banks don’t like society f’ing with their financial control. I decided to research the BTC markets over the weekend and decide whether or not I will invest short term. I could have made a 60% return in the early hours of Saturday morning thanks to catching the valuation at $70 US, but I had to give up after 2 hours of trying to buy coins from my Chinese online banking. I’d figured at the very least a 20% return (assuming a return to $85 +/-), but the price went on to peak at $115 before levelling back to it’s current valuation. I plan to continue to speculate. I’ve taken in a fair amount of data, and it’s interesting to see how the trading exchanges have adjusted this weekend. There’s been a clear correction of the disparity between them, which will have narrowed the ability to manipulate the bitcoin somewhat. It’s still wide open though, not to mention that it’s chief valuation is benched against the DOLLAR!!! Bitcoin is a blip. None of us were paying any attention to it until Satoshi Dice adopted it as method of payment, coincidingly bolstering the trading volume. Even now if you watch the blockchains you will see that the majority of transactions are being generated by Satoshi. The average trade lies anywhere between a couple of dollars and a couple of thousand, single and double digits being the norm. I’ve seen a $200k transaction take place, but that was a rarity, the next largest being $36k. Incidentally all transactions are traceable, and not anonymous as has been suggested. This begs the question of security, and possible large scale manipulation or interruption of the network. The exchanges are already suffering outages, severely limiting BTC’s value as a holding currency. Business owners are also unlikely to adopt a means of payment that has the potential to devalue in a heartbeat, though the speed of transacting (when it works) does have some merit, fees not withstanding. There’s money in BTC now while it has volatility, but once it normalises (provided it doesn’t crash in the meantime) it will cease to be of any real interest as a currency. We already know it has finite volume, inherently limiting it’s capacity as a workable means of payment in the real world. It’s current cap is 21 million coins, so although the current 11+ million coins is creating the demand, it will theoretically stagnate. Will the cap be increased at this point? Likely. Will an increase immediately devalue the bitcoin? Almost definitely. Those of you interested in mining might want to take a look at the LTC (Litecoin) market. The hash generation operates at four times the speed using the same technology, and the exchange itself although much smaller in volume has a considerably more stable valuation. I haven’t done the math on hash generation scaled to productive value mind you, so that’s a consideration. Another Cryptocoin in development is ‘Opencoin’, a startup that was drafted back in ’07. They are currently developing end clients (Java, iOS), again under the premise that it will operate as an anonymous online digital currency. There is no published release/start up date, though I’m sure they’ll be paying close attention to BTC. I personally think we might see some strength once mobile platforms are developed that offer smooth, real time, uninterrupted transactions between the Crypto currencies, but we’re already seeing this tech being adopted by the banks. One of the biggest obstacles for all of these new currencies is persuading new users to adopt them. The average joe just wouldn’t be bothered. Continued competition will undoubtedly introduce counterparts to currently available Cryptocoins. I doubt PayPal will roll over and die in a hurry, and as the tech becomes proven it will only attract further attention from current major financial players. Idealisms aside these currencies will still have to operate on a wider sphere between merchants, or they will cease to be of any real future value as a viable alternative. The Occupy movements should be reminder enough that most idealistic trajectories for future lie closer to farce than reality, so to theorise that world governments and their banks will stand in the corner with their hands tied while shiny bright new digital currencies devalue their hold on power, is a stretch to say the least. Meanwhile who remembers these Beenz!? I decided to research the BTC markets over the weekend. I plan to continue to speculate. It’s still wide open though, not to mention that it’s chief valuation is benched against the DOLLAR!!! Bitcoin is a blip. I think it was the Cyprus event which originally drew investment, press, and then notoriety which led to a cycle of more press and investment. BTC is valued against every currency but I think dollar is the main one because that is the reserve currency that most things are valued against. Incidentally all transactions are traceable, and not anonymous as has been suggested. This begs the question of security, and possible large scale manipulation or interruption of the network. Where have you heard that transactions are traceable? I believe they are quite secure. Despite information about each transaction being public, you cannot see who sent or received those transactions, thus they are anonymous. That was mentioned by Hakim at the Bitcoin meeting at Bookworm on Saturday, how Litecoin could be more practical for everyday transactions. 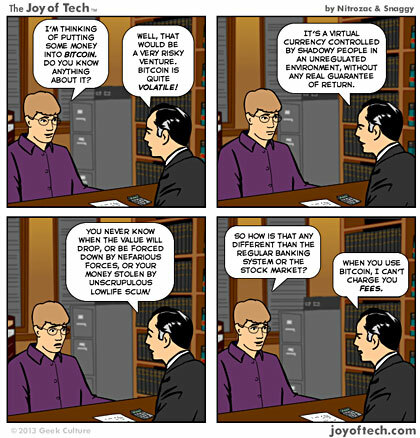 You’re right about the limitation of Bitcoin being able to replace traditional currency because of some of its peculiar design features, like the very limited amount of bitcoins in circulation. We already know it has finite volume, inherently limiting it’s capacity as a workable means of payment in the real world. It’s current cap is 21 million coins, so although the current 11+ million coins is creating the demand, it will theoretically stagnate. Will the cap be increased at this point? Likely. 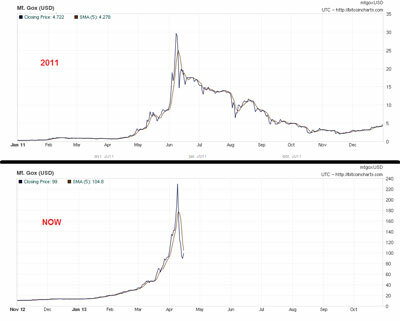 Will an increase immediately devalue the bitcoin? Almost definitely. An increase in volume would necessarily lead to inflation, thus my understanding is that no new bitcoins will be added to the system. The future limit of 21 million coins is set to be reached in 2140. Never heard of that! 1998, that is like ancient internet history. All transactions are public and pseudonymous, since you can see which wallets are involved, not anonymous. So, I’d assume that if you were under investigation for something serious enough, a forensic accountant might be able to trace the money to you eventually. If you took measures such as using mixing services, etc… that might make it much more difficult. BTC is valued against every currency but I think dollar is the main one because that is the reserve currency that most things are valued against. That was exactly my point. It’s tradeable against numerous currencies, but the biggest exchanges (and volumes) are tied to the dollar, as are all currencies and commodities. Where have you heard that transactions are traceable? All transactions are traceable via the blockchain, where they are tagged by I.P. address. You can trace the entire tree. Incidentally I’ve just seen a transaction for $1.4m US. Naturally curious, I traced it to Satoshi, so I guess those guys are making some money! Interstingly it wasn’t tagged in the blockchain as previous Satoshi transactions have been, but the I.P. traced it to the exact same point of origin. The future limit of 21 million coins is set to be reached in 2140. Right. It has no feasability as a steady currency if availability is so limited. If the current formula of block generation remains, it more or less seals the fate of bitoin as a gamble at best. So, I’d assume that if you were under investigation for something serious enough, a forensic accountant might be able to trace the money to you eventually. If you took measures such as using mixing services, etc… that might make it much more difficult. You’re right – it is possible. I just found a very in depth document on this which you can download in PDF format for free: Anonymity in Bitcoin. Downloaded it to my iPad Mini for reading later. How do you know what IP address you’re looking at? Many people only transact Bitcoins through a Linux live distribution and then Tor. A few people at our meeting on Saturday said that they only conduct transactions in this way. I have seen nothing that indicates that new, unannounced bitcoins will ever be added to the ecosystem. I believe it has always been interpreted as a gamble, and rightly so. I wouldn’t really recommend it as I ended up with less than US$.01 worth, but I guess it’s better than nothing and I basically just let the page load and then return to my other tab and do what I was already doing and then check back after a few minutes and load another ad. I didnt follow, which Satoshi are you referring to? Hang on to your hats! The entire market for BTC is in the red right now. Obviously the values of the 2013 bubble are higher by an order of magnitude. My CapitalOne360 account finally funded, so I can finally send in some money to Bitfloor to trade with. At the current rate of decline prices might be pretty attractive by the time the funds are available. BTW this is a pretty small amount of money. If you wanted to consider BTC as an investment, this would be a fraction of 1% of my overall portfolio and it is an amount I am comfortable losing. I’m not risking much here.